﻿ A great intuitive Music Notation App for Songwriting or Learning to Read Music which has sold in 75 countries around the world! Version 3.2 is now available! 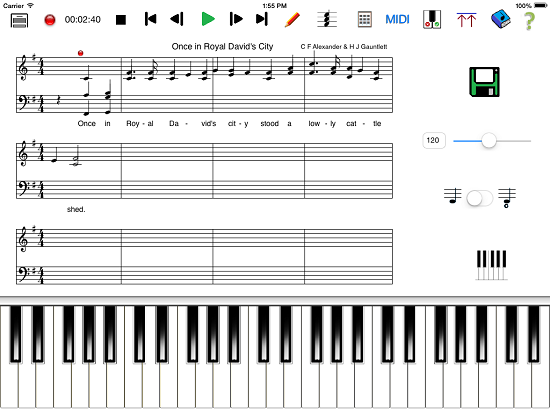 MusicWriter can now be used to transpose songs to a diffferent key. 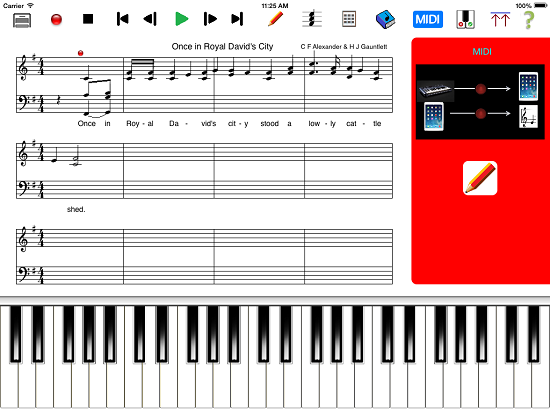 As a learning tool, our MusicWriter iPad® music annotation iphone app is the fastest way to learn music, for all ages, allowing you to quickly learn which notes on the piano correspond with their location on the music stave. 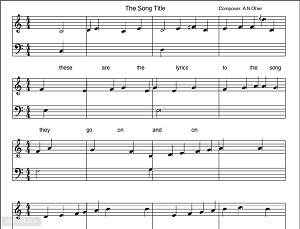 As a music notation application it is the easiest and most intuitive to use, and proves to be a great tool for song writers to put down song ideas and create music simply and easily, in the shortest possible time. MusicWriter bridges this gap, allowing the pupil to concentrate on each area, without getting confused. You can easily create songs, play them back, print off the resulting music, or email a PDF copy of the music. You can even create great songs with no musical knowledge if you wish. Once you have created your song, it may be easily edited, notes, time or song lyrics can be easily be inserted or removed anywhere in the song. Test yourself by playing the song, with or without note markers displayed, at the end of the test your accuracy score is calculated and displayed. NOTE: MusicWriter can be used perfectly well without any MIDI hardware or software. MIDI functions are only added, as a free add-on, for those who prefer to use a proper keyboard. If you wish to use MusicWriter with a MIDI keyboard, first connect your MIDI keyboard to your Powered USB Hub, using a USB type B to USB type A cable. Then connect your Powered USB Hub to your Camera Connection Kit(USB Type A to iPad Lightning connection type). Then attach the Camera Connection Kit's Lightning connection to your iPad. Then start MusicWriter and click on the 'MIDI' button to show the MIDI Control tab in MusicWriter. If you now press keys on your MIDI keyboard you should see the upper indicator light flashing on the MIDI Control tab, showing that data is being received. The lower indicator light flashes when notes are actually being written to the Score. Create a new composition in MusicWriter(upper left hand button) and then click the 'Record' button(2nd button, red dot). Now as you play your notes will be recorded in the new MusicWriter composition. The duration of note is automatically calculated according to how long you press each note. When you have finished recording press the 'Record' or 'Stop' button. If you select the 'Edit'(pencil) button at the bottom of the MIDI Control tab it will allow you to insert notes in an existing composition at the location selected, or, if an existing composition is Playing this mode will allow you to insert notes as the existing composition is played.